12:30 PM: Hello from Woodbine! Because I’m here, and because I’ll be running around today to catch the Win and You’re In action for the Breeders’ Cup (follow @breederscup or like the Breeders’ Cup), I thought I’d try something I haven’t done in a while — live blogging. I might be rusty — we’ll see how it goes this afternoon. Anyway, the post times for today’s Challenge stakes are 3:04 PM ET (Nearctic, Win and You’re In the Turf Sprint), 4:38 PM ET (E.P. Taylor, Win and You’re In the Filly and Mare Turf), and 5:44 PM ET (the main attraction, the Canadian International, Win and You’re In the Turf). 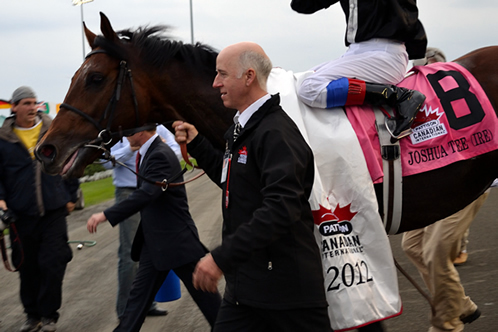 For even more on-track International coverage, follow @woodbineracing or @tripledeadheat. 12:45 PM: Despite rain that fell until about 11:00 this morning, only Al Khali has scratched from the International. Trainer Bill Mott cited the altered turf condition — it’s currently listed as GOOD — as the reason. There are no scratches in the Nearctic or the Taylor. 1:18 PM: About the turf … Ernie Munick talked to track superintendent Irwin Driedger on Friday about the grass. One part of the conversation that didn’t make it into Munick’s very informative video was about the backstretch rise, which apparently sounds more daunting than it actually is. 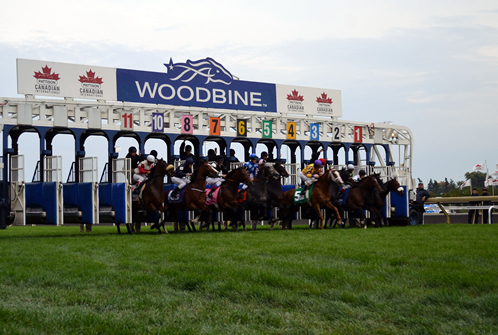 According to Driedger, a retired Sovereign Award-winning jockey who knows the Woodbine grass on and off a horse, the ground slopes up about 3 1/2-4 feet over five eighths starting in the chute, but the rise is so gentle neither horse nor rider notice. Also of interest — the backstretch is always a little softer than the stretch. Something to keep in mind today. 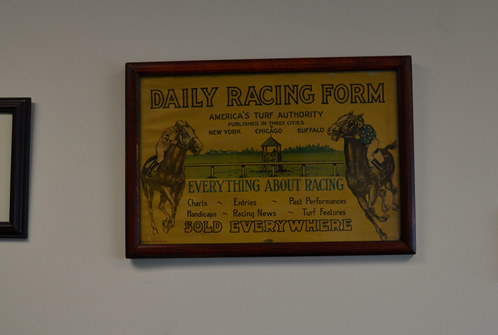 2:06 PM: A horseplayer’s lament, overheard in the press box: “When you hit the ALL button, the chalk always wins.” The G3 Durham Cup, coming up at 2:31 PM, is the start of the guaranteed $100K Pick 4. I’m looking at a fresh Vertiformer for a little upset. 2:33 PM: Slow fractions, lone speed. Sometimes it doesn’t pay to stand against the favorite. 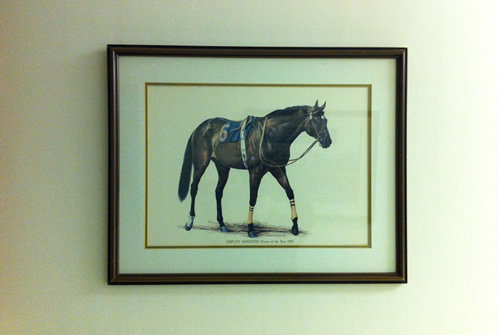 Delegation, 6-5, wins the Durham … and I decide now is a good time to head toward the paddock for the Nearctic Stakes. 3:50 PM: John Velazquez comes to Canada to get beat by Ramon Dominguez. Next Question was 16-1, not the longest shot in the Nearctic field (that was Super Chunky at 33-1), but not well regarded coming off a win in a turf AOC, in which he was not claimed, at Belmont. The Nearctic horses were running in lane two of the turf course; the temporary rail has already been taken down for the E.P. Taylor and International, which will be run over pristine lane one. 4:05 PM: The Nearctic replay (chart). 4:10 PM: Back down to the paddock. Because one of her French connections ran a circuit around the International eve cocktail party, French flag streaming behind, I may take a flyer on Pagera. She’s 12-1, 26 minutes to post. 5:00 PM: Hey, second! That wild stab did better than most of my handicapped picks lately. (Oh, Fantasy ‘Capping! My $0 standing haunts me.) It doesn’t sound as if E.P. Taylor winner Siyouma will be taking her guaranteed spot in the Breeders’ Cup Filly and Mare Turf. Trainer Francois Doumen said after the race that she would be shipped home, and then might start next in Japan. 5:20 PM: The E.P. Taylor replay (chart). Siyouma in the Woodbine winner’s circle. They’re off in the Canadian International! Joshua Tree parading in his International garland. 7:27 PM: The Canadian International replay (chart). 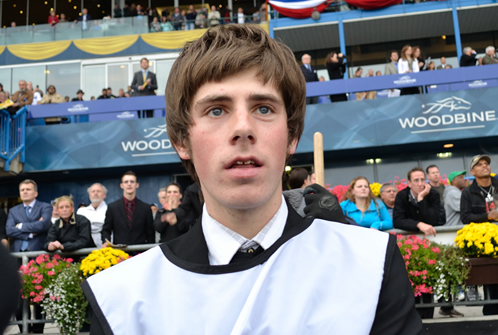 The lad who led Dandino to the Woodbine paddock watches as the 25-1 shot finishes second. He’d been shouting, “C’mon, Jim.” And then he went silent. Dettori is mobbed by autograph-seeking fans as he makes his way from the track. “Help, help,” he jokingly called as he shook hands and signed programs.